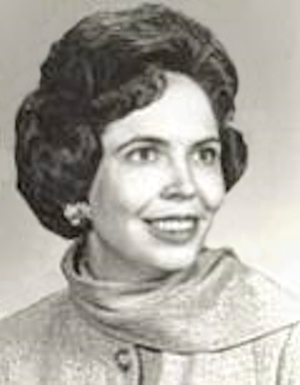 Obituary – Dunn, Marcia Lee (Woodruff) « Perry High School Alumni Association, Inc.
Marcia W. Dunn passed from this life on January 9, 2014, after a lengthy illness. Marcia was born on July 17, 1929, at St. Anthony Hospital in Oklahoma City, Oklahoma. She was the daughter of Winifred Brengle Woodruff and Marsh B. Woodruff. Marcia’s early years were spent in Perry, Oklahoma, until her parents moved to Blackwell, Oklahoma. She graduated from Blackwell High School in 1947 and then attended The University of Oklahoma. While at The University of Oklahoma, Marcia was initiated into Delta Delta Delta sorority. She majored in marketing, graduating in 1951. After graduation from The University of Oklahoma, Marcia was employed with Beech Aircraft. In 1953, Marcia married George Murphy, an Army Air Force mechanic. They lived in South Carolina, Georgia, Illinois and Norman, Oklahoma. While attending law school at The University of Oklahoma, Mr. Murphy was tragically killed in a one-car automobile accident. After her first husband’s death, Marcia worked in law offices in the Oklahoma City area. While visiting her parents in Woodward, Oklahoma, she met a local rancher, John W. Dunn. Marcia and John shared many common interests and were married on January 22, 1958. They made their home in Woodward until John predeceased Marcia on February 15, 2000. Marcia loved to read and was an accomplished bridge player, being named a Life Master at bridge many years ago. She was a longtime member of the First Methodist Church of Woodward. Most importantly, Marcia was a devoted and loving wife, mother and grandmother. Marcia is survived by two children, Cynthia Ann Dunn Riesen and John William Dunn, Jr., and their spouses, Thomas Coffey Riesen and Vionette Torres Dunn. She is also survived by eight grandchildren, William Dunn Riesen, Matthew Albert Riesen, Annie Frances Dunn, John W. Dunn III, Ellie Katherine Dunn, Zachary Davis Dunn, Mia Cristina Miles, and Ashley Bowes Cash; her niece and nephew, Mary Jane Glass and Giles Avriett; and son-in-law, Peter Bowes. Marcia was also predeceased by her daughter-in-law, Donya Hicks Dunn; her daughter, Diane Bowes; and her grandson, Peter Bowes ll. The family wishes to thank the nurses and staff at Epworth Villa for their loving care of Marcia over the last seven years. In lieu of flowers, memorial contributions may be made to the Oklahoma Medical Research Foundation, designated to research for Alzheimer’s and age related diseases, 825 NE 13th St, Oklahoma City, OK 73104. Services are scheduled for Monday the 13th of January, 2014, at 2 p.m. at All Souls’ Episcopal Church, 6400 North Pennsylvania, Oklahoma City, Oklahoma.